Since its beginnings, motorcycle Grand Prix sport has exuded a very special fascination for motor sports fans. The race on the Nürburgring Nordschleife, the Tourist Trophy on the Isle of Man, or the “wet races” in the notorious driving rain of Austria’s Salzburgring are still as legendary today as Luigi Taveri, Bill Ivy or Ángel Nieto, the former stars in the 125cc class. 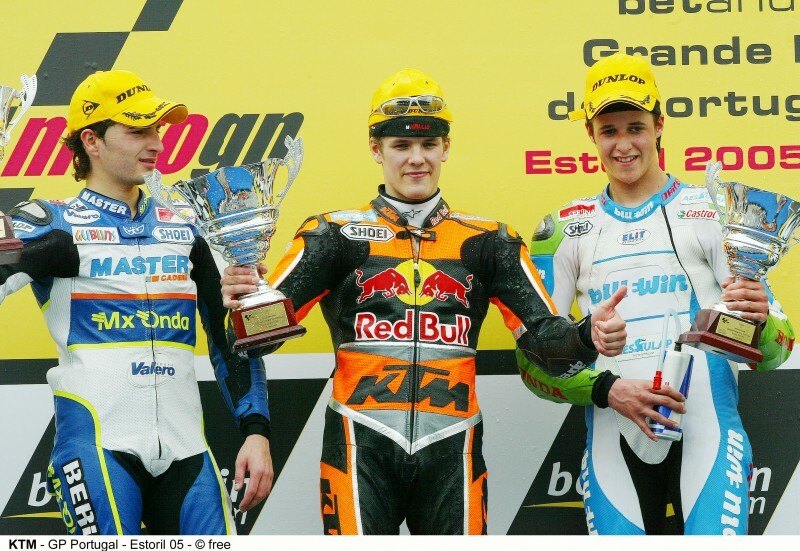 In 2005 – ten years ago – Finnish KTM factory rider Mika Kallio became Vice World Champion in the smallest Grand Prix class; on top of this, KTM dominated the constructors’ championship. As early as the mid-1950s the then fledgling motorcycle manufacturer from Mattighofen, Austria, successfully took part in road races with a 125cc four-stroke machine, although KTM did not participate in the Road World Championships, which were launched in 1949. Sporting activities were discontinued as the motorcycle crisis set in at the end of the 1950s and were only resumed at the end of the 1960s; however, at the time, activities were restricted to near-series offroad racing. In 2003 – in the 50th anniversary year of motorcycle production – KTM presented the 990 SUPERDUKE concept at the Milan fair, making it clear that the emerging Austrian motorcycle manufacturer also intended to position itself in the segment of bigger-engined road bikes in the future. The return to road racing was only logical. From the outset, KTM took part in the top class, Grand Prix racing, to document what engineers from Mattighofen, Austria, were capable of. 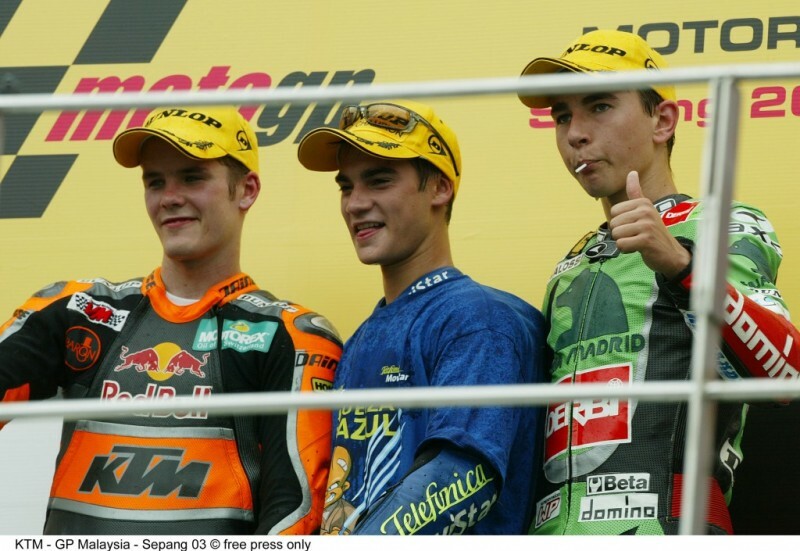 And the very first season saw the first podium for the orange racers, with 20-year old Finn Mika Kallio taking second at the Malaysian Grand Prix in Sepang. This was obviously a good patch for KTM, with Casey Stoner, who joined the team in 2004, taking the first Grand Prix victory one year later on the same spot. 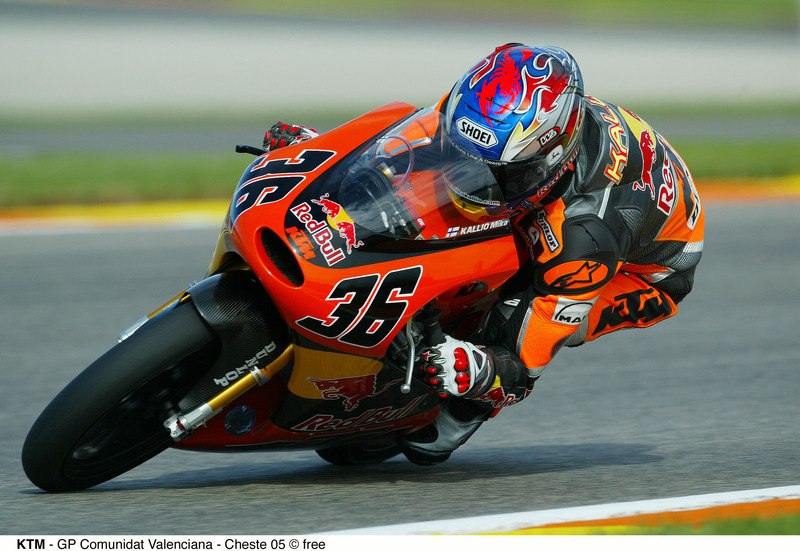 In 2005, Mika Kallio then became the “No. 1” in the 125cc team along with Julián Simón and Gábor Talmácsi. At the very first race in Jerez, Spain, Kallio came second – a result that he managed to top in Estoril/Portugal just one week later. Pole position was followed by the first victory for the Finn. And in the next seven races, Kallio was the pole setter no less than six times. But, the “Flying Finn” was not the only winning rider on the KTM team. 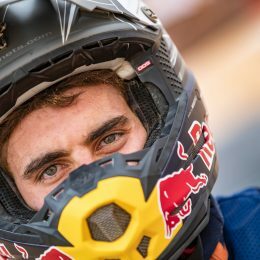 Up to the Grand Prix of Qatar in Doha, three rounds before the World Championship final, he was neck-and-neck with Talmácsi with three wins apiece, and Julián Simón, the third rider, had also already notched up a Grand Prix victory. At the end of the season, things were very tight. Although Mika Kallio won the final in Valencia ahead of Talmácsi, taking his fourth victory of the season, it was Swiss rider Thomas Lüthi who became world champion with a lead of just five points. A single place better on the podium would have seen Kallio take the World Championship crown. 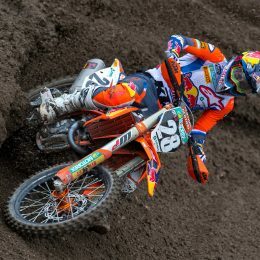 Despite tying on points, the greater number of GP victories would have tipped the balance in favor of the KTM rider. However, becoming World Championship runner-up was already more than you could expect in what was just the third year of KTM’s Grand Prix commitment. The fledgling World Championship runner-up, born in November 1982 in Valkeakoski, Finland, had ridden a minicycle through the paddock as a child when traveling with his father Hannu, who was a successful racing rider himself. At the age of twelve, Kallio for the first time took part in one of the ice races so popular in his home country; and just two years later, at the age of 14, he took part in a road race, which he immediately won. Later on, Kallio became the Finnish champion twice in a row, before debuting on the Grand Prix scene in the German Grand Prix at the Sachsenring in 2001. Just one year later he was a regular rider on the team managed by Aki Ajo, the team manager of Red Bull KTM today. The “rookie of the year” had not gone unnoticed by KTM, who hired him as a factory rider for the new 125cc team, where Kallio soon showed that he was one of the fastest riders in the 125cc class. Becoming runner-up in the World Championship was only the start of Kallio’s successful cooperation with KTM, which lasted until 2008 when KTM discontinued its 250cc Grand Prix project. Back in Mattighofen, there was more to celebrate on top of Kallio’s World Championship runner-up laurels: Gábor Talmácsi took the bronze medal in the 2005 World Championship season and with Julián Simón taking seventh spot, KTM had a third factory rider in the top ten. 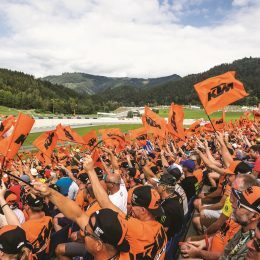 Despite missing the riders’ World Championship by the closest of margins, the constructors’ title, which is easily as important, went to KTM, who clearly outpaced the second placed manufacturer. In the Constructors’ World Championship, which is particularly prestigious for the industry, only the best result of a brand counts in each case. With four wins for Kallio, three for Talmácsi and one for Julián Simón, a KTM rider stood on the top step of the podium in every second World Championship race. By the end of the 2005 season at the latest, KTM had become a contender to be taken seriously in the battle for the World Championship crown in the smallest class. Even after 125cc two-strokes were banned from Grand Prix racing in 2012, and replaced by 250cc four-strokes in the Moto3 class, KTM was a front runner right from the outset, with Sandro Cortese dominating the first World Championship under Moto3 rules, and KTM taking three Constructors’ titles in succession.